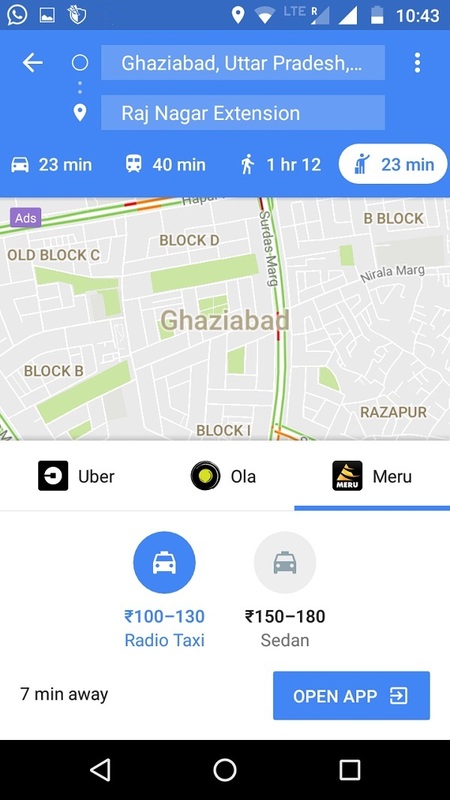 Meru Cabs Is Now Offering Great Offer On Rides With Google Maps Where Users Can Get 50% Off On Meru Cab Bookings Via Google Maps. Users Can Use Multiple Time Book And Avail This Offer. Valid Till 31st May 2017 Only. Follow Below Mention Steps To Grab Meru Cabs Google Map Booking Offer. This offer is valid for Meru trips booked via Google Maps in cities where Meru is operational. User who books Meru Radio Taxi,Meru Sedan,Meru Hatchback or Meru SUV via Google Maps will be eligible to get Rs. 50 OFF on the fare applicable. This offer is valid for multiple rides per user till 31st May 2017. This offer is valid on minimum fare (excluding service tax) of Rs.100. This offer will not be applicable for Meru Mobile App/Airport Counter/Kerb / street pick-ups or website / call center bookings. This offer is not valid on Meru Radio Taxi for Delhi NCR region. The Company reserves the right to extend,cancel,withdraw,change,alter or modify the Terms &Conditions of this offer at its sole discretion at any time during its validity with or without prior notification &without assigning any reason. The offer is at the sole discretion of the Company. In case of any disputes,the final decision will rest with the Company. All disputes arising out of or in connection with this scheme are subject to the exclusive Jurisdiction of courts at Mumbai. All other terms and conditions will be governed by the detailed T&C as mentioned on www.merucabs.com.